Lake Marion country has something for everyone. Our lakefront cottage is located on the beautiful 1100 acre impounded waters of Church Branch just across the causeway to the Big Lake. Church Branch offers a paradise for kayaking, waterskiing, knee boarding, jet skiing and nature watching. Large bass, bream, catfish and crappy can be caught right off the dock. Alex Harvin boat landing for access to the open waters of Lake Marion is just 5 minutes away. You can bike or walk to the Santee Dam (Randolph's Landing is located at the foot of the Dam) and ride or walk on top of the Dam. There are several locally run restaurants nearby and day trips to Charleston, Columbia, or the beaches are ever so easy for a change of pace. If you are an early riser, you'll enjoy the sunrises from the screened-in porch overlooking the lake. 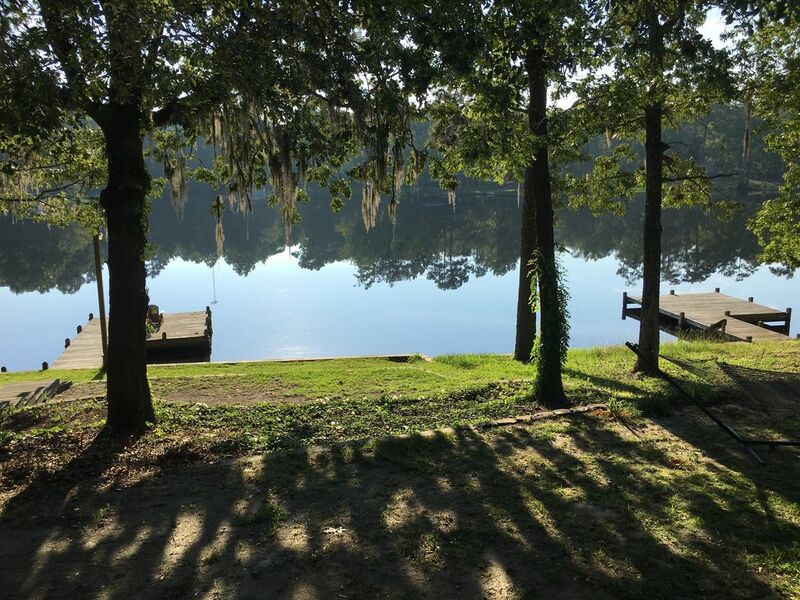 In the afternoon, you'll relax on the dock in the shade of the oak trees sipping on your favorite beverage and enjoying the sights and sounds of nature. Very nice. Location is great! Pros: We enjoyed this property very much. It is in a great location, convenient to golf, restaurants, Walmart, bait shops etc. Very quiet, traffic on the lake was no where near as busy as it is on the big lake which is what we wanted. Cons: House could use some attention to cleaning, fixtures somewhat dusty. Microwave should be replaced. Linens need to be replaced. Towels and dish towels had stains. Dock light was out, so you could not enjoy it at night. Wonderful large screened deck with ceiling fan that overlooks the lake. Lovely view. House was adequate, but needs a good cleaning. Refrigerator was dirty inside and out; heavy dust on ceiling fan and wall hangings. Was able to use the grill once to heat some smoked sausage on the gas grill slowly while the gas ran out. House needs to be stocked with what guests need before their visit. We enjoyed being there, so the "not really" is not what I would want to say, but I can't say we loved it either. It would be fine if they took more care in cleaning and stocking. I am quite surprised by your comments, as I was in the house just prior to your arrival and personally cleaned the fridge which is definitely an older model with some dings on the surface, but not dirt. The refridgerator was thoroughly disinfected prior to your arrival. You also had my phone number which, had we known the propane tank was empty could have replaced with a full tank, but could not address since it was an unknown issue. We actually just bought that tank the previous week, so that is also surprising. Never the less we always have taken pride in the house and strive to make the stay a pleasant one, we cannot address issues that we are not aware of. We have never had a review with less than 5 stars so all I can say is that we are sorry you were disappointed however that is not the usual experience. Great place for a quiet getaway. We just stay at this wonderful house for 4 nights and LOVED it! The house was perfect for our family. The decor was charming. The house has everything needed: 3 bedrooms with a lot of space, 2 bathrooms, a large kitchen with all amendities needed. The dining room table is large enought for 6-8 persons. The living room was spacious and very comfortable. We felt really like at home.The large screened-in deck is lovely and the large fan help cool down from the heat of summer. We used the BBQ right off the deck. It was our daughter first fishing adventure, and she really loved it. The deck is right off a path down from the house. Our kids also enjoyed the swing and the relaxing hammock under the shades. Overall we were so fortunate to find this rental property and a very reasonable rate!!! I cant wait to return!!! Good place to get away from everything.20 mile roung trip tp Manning,bring your food and drinks,no fast food here,good dock for water toys.After dark,the boats come in and it gets quiet,real quiet.House is comfortable,kitchen is laid out nice.Just a slow laid back place,nobody gets in a hurry for anything.Be sure and watch speed limits.Big screeened porch,perfect to watch the water toys or just watch the sun rise over the water,gas grill on outside deck.If you want to rest and do nothing,this is the place.Verizon cell doesn't work,have to go 5 miles up 260 to find sig,AT&T does work..Local stores have usual stuff,worms ice adult beverages no major supplies.Manning has the wal mart McD,BK,KFC,Hardees,Arbys,Piggly Wiggly,IGA.Lots of side roads to look at houses for sale in area..Go to unpack,miss the porch..